Today's destinations are Kahawta and Adi Abeito. 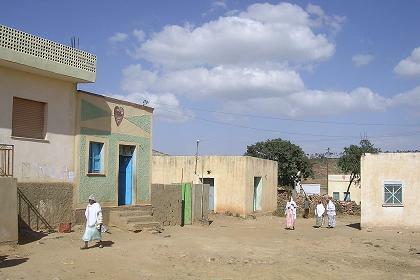 Kahawta is one of the southern suburbs of Asmara. There is a lot of construction sites and recently finished housing complexes and offices. In May I visited the area with Michael, but then we were focusing on the area around the new church and beyond, to visit the remainders of the crashed Bulgarian plane. 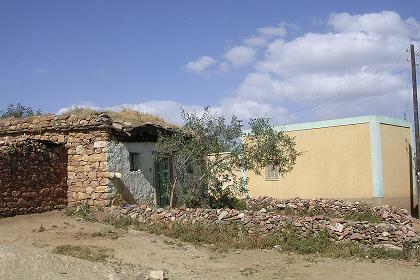 The Segen Construction Company is building houses at various sites, varying from modest houses for citizens with low standards of living, as well as housing projects for Eritreans that live abroad and want to invest their money in Eritrea, expecting to return when they retire. I drink coffee with Almaz. I am not to leave before I have tasted her spaghetti. "Tu'um, tu'um, tu'um!" By now I know that the word 'tu'um' (delicious) is used to reward the cook. Repeating it three times will make your judgment more convincing. 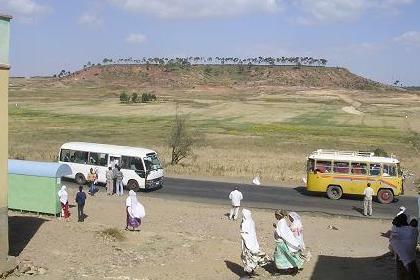 Around noon, I take the bus back to the center, and from there a bus to Adi Abeito, a small village just outside Asmara, on the road to Keren. It is a small village. After two hours I have seen it all, and I return to Asmara to try to find Maaza in Mai Temenai. I visit the local administration of Mai Temenai, telling I am looking for Maaza of the Ministry of Tourism. I have a telephone number, but it is not correct. Without the fathers name they cannot help me. Two men, visiting the office are curious. Again I tell them I am looking for Maaza, working for the Ministry of Tourism. One of the men knows where she lives. I have to wait a few minutes, until he has finished his business in the office. We are only a few blocks from her house. I drink tea with Maaza and her mother and we chat for an hour. About her family, the ministry, about Eritrea. She walks me to the bus stop. In Bar Selas I enjoy my daily medicine, some Asmara beers, and Freweini, hiding for my camera. 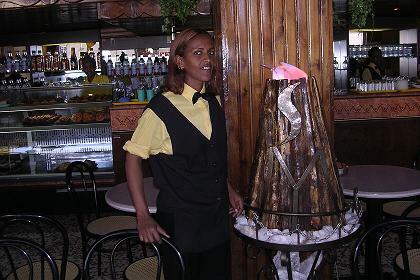 Selamawit - Damera Bar Asmara Eritrea. 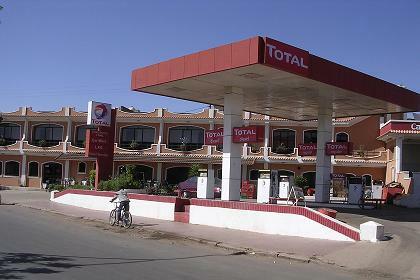 Total fuel station & Mistes Hotel & Restaurant - Kahawta Asmara Eritrea. 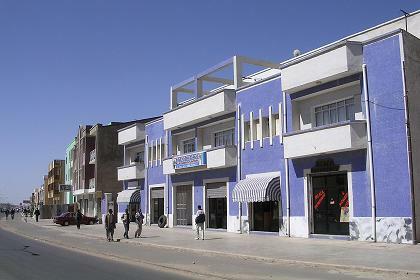 Apartments and shops - Kahawta Asmara Eritrea. 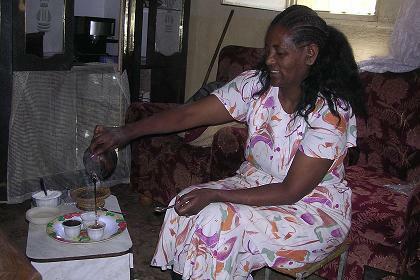 Eritrean coffee ceremony with Almaz - Kahawta Asmara Eritrea. 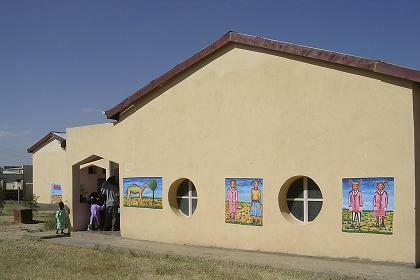 Primary school - Adi Abeito Asmara Eritrea. 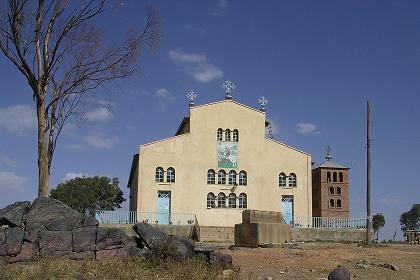 Coptic church - Adi Abeito Asmara Eritrea. 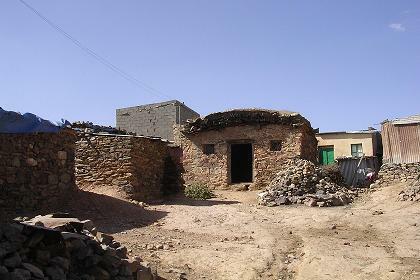 Traditional houses - Adi Abeito Asmara Eritrea. Street scene - Adi Abeito Asmara Eritrea. Bus stop, modern mini bus and Fiat old timer - Adi Abeito Asmara Eritrea.